A Home Office minister compared drug gangs who groom children to paedophiles in response to MPs who demanded the government step up its approach to County Lines violence. 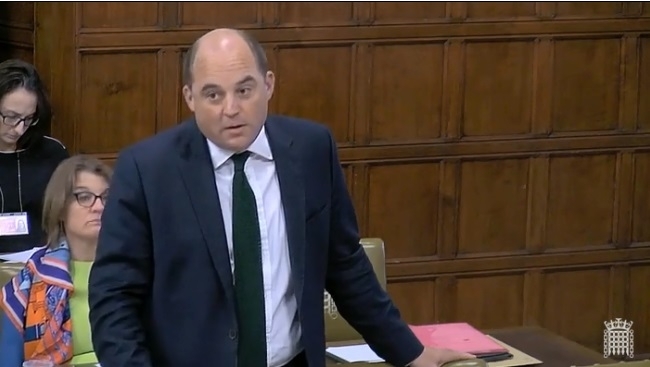 Labour’s Stephen Doughty, MP for Cardiff South and Penarth, told Home Office minister Ben Wallace this week during a Westminster debate: “We warned you this was going to happen because of the cuts that were happening to police, because of the cuts to community services. “I’m very proud that South Wales Police has a very strong police performance on dealing with violence but like many other police forces they are struggling to cope. “I’ve spoken to individual police officers and senior police officers who are telling me about the strains they are facing in crime demand, non crime demand. “The reality is, and the government can argue about this all day long, the number of police officers on our streets has come down substantially in the last few years, the number of community police officers, the number of PCSOs and others. “Unless you have those police officers on the ground who have the relationships with young people and that crucial local intelligence we are not going to be able to deal with this problem. Minister for Security and Economic Crime Mr Wallace responded: “I’m not deaf to neighbourhood policing, I’m not deaf to cuts to police. I know that there have been cuts to police I do not deny that. “I worked in intelligence. If no one picks up the phone you’re flying blind. Mr Wallace called on MPs not to have “knee jerk” reaction to draft legislation regulating digital communications between members of the public. “What has accelerated County Lines, what has really gripped has been social media and secure communication, a la carte drugs buying. “People order a la carte through Whatsapp through Instagram, drugs that is communicated safely with end to end encryption to the drug baron, to the drug buyers. You can buy anything. The fuel on the fire has been this safe environment. MP for West Ham Lyn Brown spoke of how her constituents have been left traumatised by a spike in knife crime in the area. “Nine young lives have been lost to violent crime in West Ham since 2017. “These people have created a cruelly efficient business model to distribute and sell drugs using our children as expendable cheap labour. “The children are living terrifying existences, witnessing depravity and violence almost day to day. It’s a modern day version if you like of sending children up chimneys. They are disposable children. “I’m sure the minister will tell me that losing 21,000 police officers and the fact that the Metropolitan Police Service has lost more funding per person than any other force in the country has nothing whatsoever to do with it. A teenage boy who plucked up the courage to testify in court against a gang member in a criminal trial has been horrendously let down by the system, Ms Brown said. After experiencing serious violence and death threats, “Ashley” left his home behind and assumed new identities with his Dad “Nathan”. Although Nathan used to have a stable job, the father and son were moved to a housing association property with asbestos, no furniture and no heating. They were left penniless and without food over Christmas and are now £4,000 in rent arrears because they have not been issued with new photo IDs. Nathan has been unable to access benefits or start a new job and has resorted on several occasions to telling job centre counter staff about their new identities. She also called on the Home Office to develop a new third party reporting system as “Crimestoppers is simply not trusted”. “My young constituents absolutely believe that Crimestoppers calls are traced by the police and the callers are being attacked as snitches as a result. There is no doubt in their mind that Crimestoppers is not safe and the police will arrive at their doorstep should they phone it.